This buggy little book has got some plot holes. If you can read past the narrative bumps, you will find a sincerely meant exposition on attitude. It’s Who Moved My Cheese for the New Age spiritual set, written on the very premise that it’s not good to be overly critical. Frustrated and overburdened businessman Mark is struggling to save his business, his home and his marriage. His friends concerned for his plight, introduce him to magic and connect him to a client of his who then becomes Mark’s teacher. Thus begins a journey – or a golf lesson with a side of potato– all about mind over matter. There are serious problems with the craft of the writing in the Magician’s Way. One part magical treatise and one part modern fairytale, Whitecloud’s book ends without the most important plotlines finished. This is probably because of a magical lesson where certain outcomes don’t matter. Unfortunately, in the realm of book writing, especially semi-fictional writing, those outcomes matter very much. We need to know if at least one of those big problems got solved. As it is, Whitecloud leaves his marriage, his career and a blackmail plot hanging in the air, never really closing any of them. That’s not to say this book is a throwaway. For magicians still mastering the art of the magical mindset, this book tells all about the required mentality in the most coherent form to date. It’s possible, unfortunately, that the inconclusive nature of the storyline will leave a similarly inconclusive imprint behind on the reader’s memory. This book will be passed on to people who want to change their attitudes with the help of a storyteller. It’s definitely not a fit for all magical students. The sentiment behind the writing is one part business-book inspiration, and one part esoteric teaching through fiction. The Sea Priestess by Dione Fortune and The Way of the Peaceful Warrior both somehow fall in a category with the Magician’s Way. Is the book life changing? For someone, probably yes. Will it change the world? Only if the world really wants to change, or, at least, only if those who read the book really want to change. This book is not so much recommended as it is pointed out. For those who feel the tug of inner guidance, they’ll come to it and the book will say what needs to be said. Others may opt instead for a dramatic reread of Harry Potter. If Whitecloud is willing to share what happened with the blackmailing Jilly or his rapidly-losing-patience wife, it might help a reader see the real benefits of releasing limitations. As it is, just when things got serious, it looks like Mark walked away from the magic or hid the results when he needed them most. Inspirational books are everywhere, and in more than one section of the bookstore. I’m sure each one inspires someone. 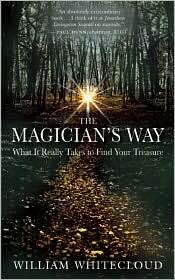 The Magician’s Way is not a standout among those inspirations, but for the right person, it might help. New World Library, 2004, 2009.